French composer living in Québec, Georges Forget began his studies with Christian Eloy at the Conservatoire de Bordeaux in the purest acousmatic tradition. During his Masters, with Robert Normandeau at the faculty of music of the Université de Montréal, he evolved towards a more melodic approach to electroacoustics. 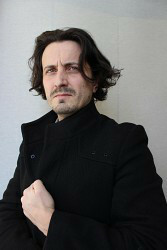 A multi-talented composer, his work can be heard in a number of theatre, video and documentary film projects in Europe as well as in North America. Georges Forget is a recipient of the Québec Societal and Cultural Research Fund and some of his compositions have been rewarded in international events (Música Viva 2002, JTTP 2007, Música Viva 2007, Bourges “Residence laureate” 2008). Presently working towards his Doctorate under the direction of Isabelle Panneton and Jean Piché, still at the Université de Montréal, Georges Forget continues to explore the use of melodic motives as the foundational element of the unity and formal perceptability of the work. His interdisciplinary project involves developing tools which allow for greater “sensitivity” in the exchanges between machine and musician.